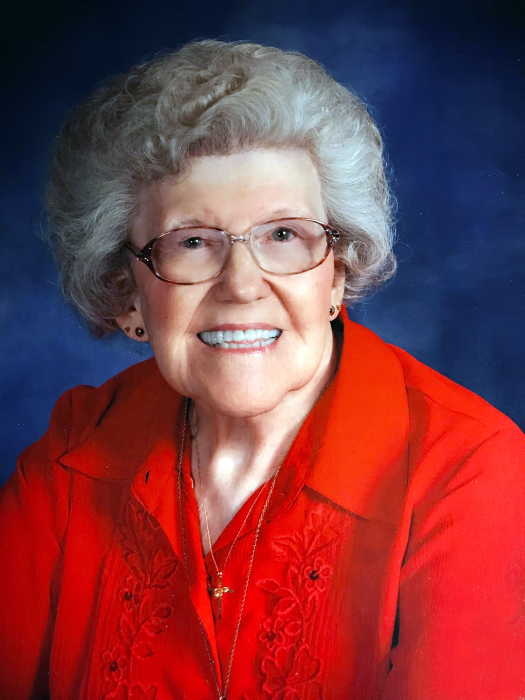 Frances M. Gigstad, 90, of Thatcher, passed into eternity on August 11, 2018. She was born September 19, 1927 in Bisbee, Arizona to Anton Mihelich & Julia Poje Mihelich. Frances was one of five children; Daniel, Ann, Alice & Walter. Frances attended school in Bisbee graduating in 1947. In 1951 she married Harry Ciancimino in Los Angeles, California and were blessed with two children; Tony & Paul. After 8 years the marriage to Harry ended and Frances began working. She had many jobs, aside from being a mother, working at the Hargis Insurance Company in Warren, Arizona, Phelps Dodge and the one she was most proud of, the Cochise County Court House Calendar Clerk of the Superior Court. In 1975, she married Guldbrand Gigstad in Bisbee, Arizona and added two stepchildren; Walter & Glenn Gigstad. She loved raising her children and caring for her family. She was very organized and meticulous and prided herself in remembering everyone’s birthdays and keeping everything organized. During this time, she earned many awards and recognitions and the one she was most proud of, the Arizona Business & Professional Woman of the year. Frances was always caring and loving of others and contributed to many worthy causes either with service or by monetary donations. She was a woman of many talents and interests. She loved music and some of her favorite songs were “The Old Rugged Cross”, “You Are My Sunshine” and “In the Garden”. She also loved movie musicals such as “The Music Man”, "The Sound of Music” and "Fiddler on the Roof”. Frances also loved making beautiful tasty cakes, cooking special recipes, Olive Garden’s breadsticks, Starbuck’s mocha, biscuits & gravy and dark chocolate, family photography and albums, the 4th of July Celebration at the Bisbee park, ladybugs, hummingbirds, her trip to New Zealand and Thomas Kinkade and DeGrazia art. She was a very loving, giving and grateful woman who was very patriotic and had a strong Christian faith who will be missed very much. She is survived by her children, Tony (Connie) Ciancimino and Paul (Sue) Ciancimino, stepchildren Walter (Barbara) Gigstad and Glenn (Peggy) Gigstad, her sister Ann Henry, 3 nieces, 2 nephews, 12 grandchildren and 12 great-grandchildren. Frances is preceded in death by her husband Guldbrand Gigstad, and her parents Anton and Julia Mihelich, and siblings Daniel Mihelich, Walter Mihelich and Alice Anderson. A memorial service will be held at the St. Rose of Lima Catholic Church on Friday, September 7, 2018 starting with the recitation of the Rosary at 10:00 a.m. followed by the Memorial Mass at 11:00 a.m. with Father Nicodemus Shaghel as Celebrant.